LIKE a swine snuffling truffles, I roved the Rhône via Berry Bros. & Rudd’s first ever tasting of that region ‘en primeur’ (wine sold before release). The venue: 1 Great George Street, headquarters of the institute of civil engineers. 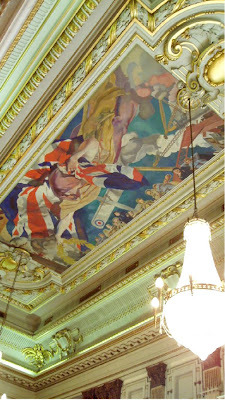 Tattooed on the ceiling above linen wrapped tasting tables was a blazing scene commemorating the work of civil engineers in World War I. From 16 producers of great repute, the wine that most impressed me was oddly the cheapest. At £8 (excluding duty and VAT) Jean-Louis Chave’s Côtes du Rhône ‘Mon Coeur’ also took mine, being improbably flash, flavoursome and concentrated – ‘which is what Côtes du Rhône should be like’, he said. Perhaps because it upstaged his other, massively more expensive wines, he appeared to keep the bottle swivelled label to the wall. Wines may be purchased from 5 March.